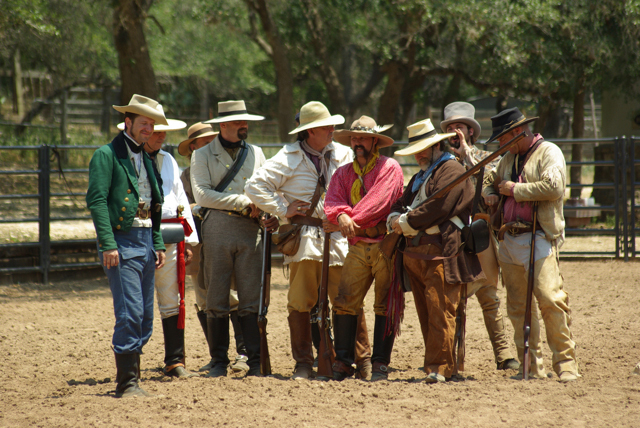 Having already produced two oral histories and a film documenting their 2008 trip to California, the Hays County Historical Commission decided to tackle a much more challenging project. They went back in time some 165 years, to be exact to tell the story of our county's namesake, Jack C. Hays. Captain Jack: the Story of John Coffee Hays has taken six full days of filming, a cast and crew of over 40, and a hefty budget to produce. 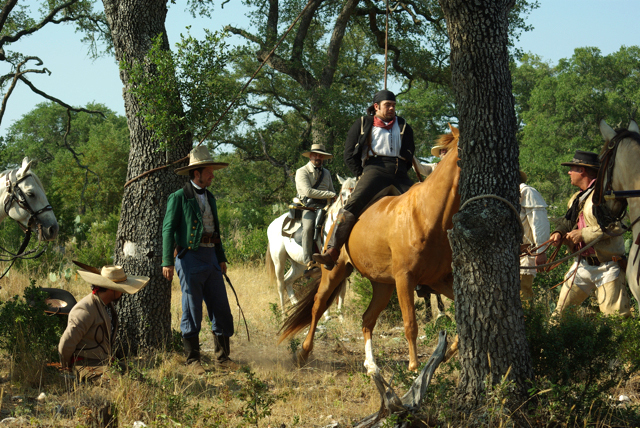 Principal photography began in mid-June at Round Top and continued June 27-29 at the Halifax Ranch and the Rutherford Ranch. On July 26, a brief final scene will be shot, and then Documentary Film Unit Director Richard Kidd will take over the long process of editing the film. Kidd, a member of the HCHC who has 40 years of experience in documentaries, film, event management and museum installation, said he hopes to have the final product available by October. At that time, copies of the film on DVD will be given to all schools in the county as well as to the Texas Ranger Museum in Waco. Until now, there has never been a documentary about Jack C. Hays, the Texas Ranger and California surveyor for whom Hays County was named in 1848. The 30-minute film will include reenactments of major scenes from Jack Hays’ life along with historical maps, drawings, and photographs. HCHC chairperson Kate Johnson said she can’t wait to get the film, along with a curriculum guide the commission will prepare, into the hands of local teachers. “We want to help young people in our community realize what a fantastic history we have in Hays County,” Johnson said. 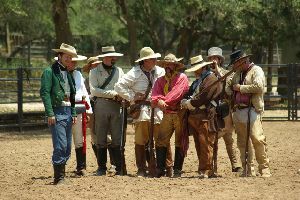 Most of the primary actors in the documentary are actually historical reenactors, led by Scott McMahon (portraying Jack Hays) who is a historical interpreter with the Parks and Wildlife Service. 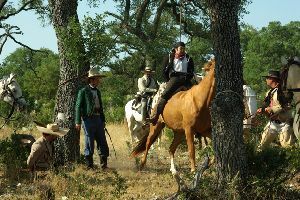 Eight local Region 6 rodeo riders were also tagged to portray the Comanche Indian warriors who fought Jack Hays and his Rangers at the Battle of Walker Creek. The group included Tanner Hileman, Jarret New, Max Ramsey, Hugh McCallick, Parker Patterson and Tyler Stone, all of Wimberley, Ethan Crouch of Smiley and Austin Barbour of Smithson Valley. The cast also includes Kate Johnson’s daughter, Katherine, in the role of Jack Hays’s wife, Susan. The script for the film is being written by Gene Shelton, a Texas author who has published four books, including one on Jack Hays. Shelton gave permission to the HCHC to use his book’s title, Captain Jack, for the documentary.